UDM Downloads > MP3 Boss - MP3 Database & Manager! MP3 Boss allows you to easily/fully manage & play your MP3 song files. 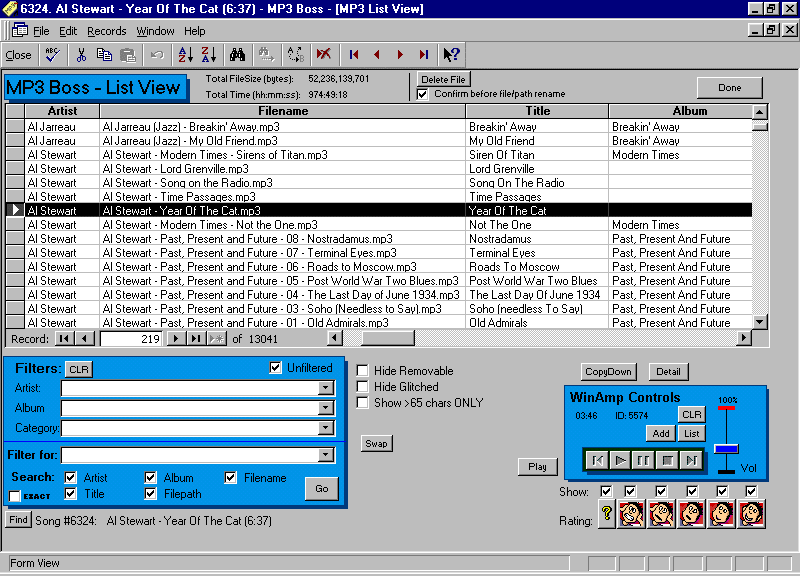 MP3 Boss includes integrated support for WinAmp, automatic scanning of MP3 tags (ID3v1, ID3v2, and Lyrics), extensive database functions (sorting, searching, filtering, reporting), general file management (rename, move or delete files -- even while that song is playing! ), file cleanup (detect exact or partial duplicates, and delete the songs you want), special functions (individually rate your songs, find filenames that will cause problems when you burn them to CD, listen to a 10s audio preview, set start and end play times), CD Label inserts, CD move utility, user statistics and much more! Easily manage all of your Napster, Gnutella, Newsgroup downloads and CD Rips! Now with full VBR support and automatic file move & rename! File AutoMove and file AutoRename will automatically move and/or rename your mp3 files using the Artist, Album, Title, Category (etc.) information available in the database. Tons of customizable features, including selectable or custom rename templates, actions to take if not all the information is available, actions to take if only a few files in a particular category exist, full UNDO, and much more. Includes WAV support, ID3v2 write support, mp4/m4a/m4p (iTunes) scanning, intelligent CD scanning, AutoBPM, SendTo, MailTo, PlayNext and enhanced auto-music identification -- including audio fingerprinting! A table of over 17 thousand verified song artists is included -- cleanup your artist names -- andsingle- click to view a webpage about the artist!